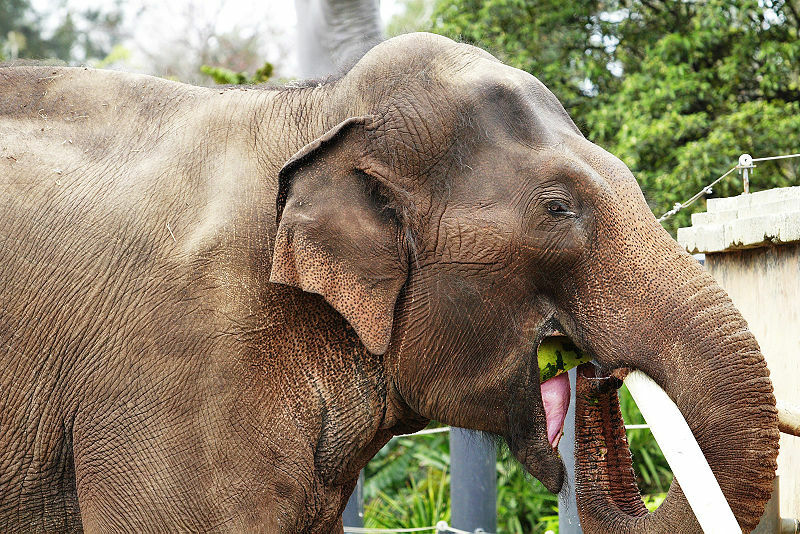 An Asian elephant snacks on watermelon. Arrested Development fans who like elephants, this is your story. An elephant named Koshik can mimic about seven words of Korean, and one of those words is "annyong," or "hello." It's not unheard of for elephants to mimic sounds, but Koshik, who makes his Korean sounds by putting his trunk in his mouth, is the only living elephant who can mimic human speech in this way, according to researchers. You can hear Koshik making his sounds in the video, but unfortunately, it does not feature his saying "annyang." Koshik resides in a theme park in Korea. His technique and ability to mimic human speech have attracted researchers, who want to know more about how an animal without lips like ours could figure out a way to make our sounds. African elephants living around humans and our noises have been known to mimic human-related sounds like truck engines revving, and according to a CBS news report, an Asian elephant that lived in a zoo in Kazakhstan might have imitated sounds from the Kazahk and Russian languages. One African elephant who lived with two female Asian elephants at a zoo became known for using the chirpy mating calls of the Asian elephant instead of the lower-frequency vocalizations of the African elephant. The fellow had to do adjust, evidently. Koshik is a 20-year-old Asian elephant. When you think about animals that mimic human speech, like crows, elephants, and possibly a beluga whale, think about what they have in common with us: They live in complex social groups where communication skills are important. Perhaps they adjust to their social environment, at least sometimes, by mimicking the sounds they hear. Koshik was so good at it that when Korean speakers came in as stenographers for his communication, they could clearly distinguish his words in Korean.